There are many hypnotizing metros in St Petersburg that will amaze anyone that ride them. The Russian metro stations are among the most beautiful metro stations in the world. Especially in the earliest construction that takes inspires of Stalin architectural in palace design in mind. 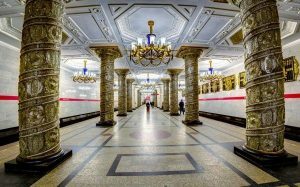 These type of pretty station you can observe by visiting the beautiful metro stations in Moscow. The second largest city in Russia is known for their high appreciation for art, this fact portrays heavily on their metro stations. Therefore, the visitor can enjoy beautiful classical decoration on floors, walls, and ceilings. Some stunning decoration involves art deco, chandeliers, statues, and paintings. So, you have more reason to visit Saint Petersburg. The metro station is among the unique Russia things in St Petersburg. Here are some of hypnotizing Saint Petersburg Metro Stations. The metro in St Petersburg is not only transportation media. It has remarkable beauty and the architectural ingenuity of its stations. There are nine stations with all eight station hold of cultural significance. Here are some of hypnotizing metro that worth making a stop at while en route. The theme of this station describes the defense of Leningrad during the Second World War. This hypnotizing metro display grand columns and marble interior with the commuter in mind to create a palace surrounding. Moreover, the ceiling of the station has 46 columns, with 30 marble and 16 glass columns. At the end of the platform, a large mosaic mural shows a woman holding a child. In addition, this is the first metro stations built in Saint Petersburg. The first train departed here, making the city as the second operational subway in Russia, after Moscow. This station gets their name after the Kirovsky factory located in the vicinity. it is a common thing to name after the metro stations with a popular building or landmark nearby. Moreover, the general theme of the station is the development of the socialist industry. Therefore, the station also displays similar social remarks. You can see the haut-reliefs on the walls that portray the various industries of the former Soviet Union countries. Moreover, mass production such as electricity, oil, coal mining, and metal production describe distinctively. The station has a strong modest grey-colored marble. The station was the first station to use a lighting system that imitated daylight. it gives a natural and bright imagination. However, later o,n the station replaced them by ordinary electric lighting. This is another hypnotizing metro from the Soviet Union era. Saint Petersburg build this metro station around the same time as Kirovsky Zavod on the red line. However, it promotes more from various professions throughout the Soviet Union. The wall is full with a decorative painting of haut-reliefs of doctors, builders, farmers, sailors and other highly regarded professions. Moreover, there are also many social icons that decorate the station. Therefore, you can see a large mosaic of Stalin as a tribute to his works. However, there are many who dislike such painting to decorate this public place. So, in 1961, the Saint Petersburg metro system cover it. To commemorating the Russian victory over Napoleon in 1812, the station got the names Narva Triumphal Gate. Many famous public places In Russia based on a famous person in the city. This metro station gets its name from a famous poet Alexander Pushkin. Moreover, there is also another station from his name in Moscow. You can see Puskin sculpture at the end of the stations. In addition, Russian respect this iconic figure that you commonly see flowers laid beneath it by locals. The background of the statues is a painting of Tsarskoe Selo a suburb area of St Petersburg where the poet spent most of his youth and received an education. The place also changes its name into Puskin to appreciate his works. Name changing is very frequent in Russia. The name of the station means ‘Square of the Revolt’, to describe the metro station located in Saint Petersburg. Moreover, the station design also revolves around the same concept. It highlights the Russian history of the October Revolution of 1917. It was the first station in St.Petersburg with two exits. Moreover, one of the exits leads towards the Moskovsky Railway Station, where you can see another iconic landmark, the four bas-reliefs. Each depicts Lenin lives that are part of history. One relief depicts Lenin delivering a speech after years in exile, another shows Lenin in his hut, another one shows Lenin speech at the Tauride Palace, and the last is of the cruiser Aurora. This station is close to the old St Petersburg stadium. Therefore, it takes the sports theme to its decoration and atmosphere. You can see many sports murals, like Olympic athletes and Grecian gods on the walls. Moreover, other feature like lamps looks like Olympic flames. On the other hand, the station has two levels. The both also depict sports decoration, especially related to Russia. On the top level, the visitor can see the text of Pierre de Coubertin’s poem Ode to Sport on the wall. The overall interior encourages a healthy lifestyle. This metro station displays Russian birth as a nation. It means ‘International’ station that also displays liberation after the Second World War. Moreover, the surrounding area depicts beautiful hypnotizing metro feature. There is a mosaic mural of Atlantis holding up the world at the end of the station. Mezhdunarodnaya station is the last station form the Saint Petersburg metro systems. Futuristic stations compared to other metro stations in Saint Petersburg. The Admiralteyskaya station is one of the most recent and deepest stations among the stations in the city. It is so deep that you need to take two escalators down 86 metres (282 ft) underground. In addition, it has some of the amazing sailing artwork on the walls. It is a dedication for Russian admirals and naval leaders.